BISON SPORTS - Tegan Turner started running track in grade nine. From the get-go, the Nelson McIntyre grad knew she was suited for sprinting. "My high school track coach kind of shifted everybody towards distance," she says. "But I said, I'm not a distance runner I promise you. He had me run up and down the halls a couple of times and luckily I convinced him well enough to let me keep trying just sprinting, so it worked out." Originally a gymnast, Turner started running as a way to spend more time with her friends and track was the only sport that fit into her schedule. But in her heart, the former was still where her passion lay. Unfortunately, she ran into some shoulder issues in grades 11 and 12 which eventually forced her to turn her direction from gymnastics to sprinting in university. It's safe to say the decision has paid off for the fifth-year captain. 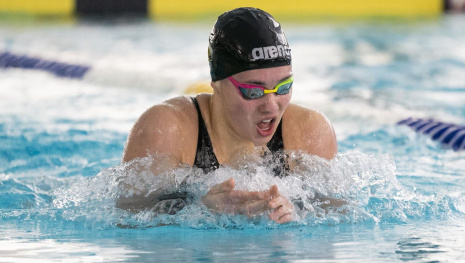 Turner began to turn heads after her first year at the U of M. She earned three gold medals at the 2015 Western Canada Summer Games (WCSG) – one in the 100-metre, one in the 200-metre and another as part of Team Manitoba's 4x100 relay team. Showing her selfless attitude, Turner was quick to praise her relay teammates when discussing her sprint dominance at the games. "It was just a wonderful group of people to be around. I think that is what I took from that experience. Yes, we won those medals and it was excellent, but just to really be integrated with such a wonderful group of people, I think that's why we ended up doing as well as we did." Turner's achievements at the WCSG were just a tease of what was to come in future years. She finished in the top 20 in both the 100-metre and 200-metre at the 2016 Canadian Olympic Trials and the following year broke a Canada West record in the 60m with a time of 7.42 seconds at the conference championships. The record-breaking time was even more impressive considering Turner was dealing with the beginning of a particularly nasty cold. But once again, Turner was first to praise others before herself when discussing her achievement – this time it was long-time speed and power coach Alex Gardiner who earned a shout out. The duo has developed an incredibly strong bond over the last five years, with the latter being particularly effective in helping the former "see the bigger picture and not only see the process but enjoy it." "Not every race is going to go the way you want it, but you take something from it. What are you learning? That's a question [Gardiner] asks me every time no matter how the race goes." With Gardiner's help, Turner took an even bigger step last season, finishing second at nationals in the 60-metre. Consistency with stretching and the entire "pre-hab" process were big factors in the senior's results. Not surprisingly though, she gave all praise to her coach. "Alex is a genius at what he does. I really feel no other way around it. He sees so far ahead and at the same time is able to adapt things so well to where you're at within the day or week. For me, it was being able to pay attention to how I feel during the day and understanding the long-term plan. I'd been really consistent in my training program and it all ended up coming together when it needed to because of that consistency and commitment." Turner hasn't missed a step so far this season and looks primed for another top three finish at the conference championships as well as nationals – which the Bisons are hosting. But when asked about what stands out during her U of M career, it's not the victories she recalls, it's the lasting relationships that she's formed. "I could sit for hours and talk about how positive and wonderful everything has been Bison sports and track-wise. Definitely the relationships I've built moving forward is a big one for me. I have tons of friends that I know I'm going to keep for the rest of my life and lots that I've learned from coaches and therapists. I'm just really grateful." Catch Tegan Turner and more Bison track and field athletes at the 2019 U SPORTS Track & Field Championships, hosted by the U of M from March 7-9, 2019. Day and championship passes are on sale now.